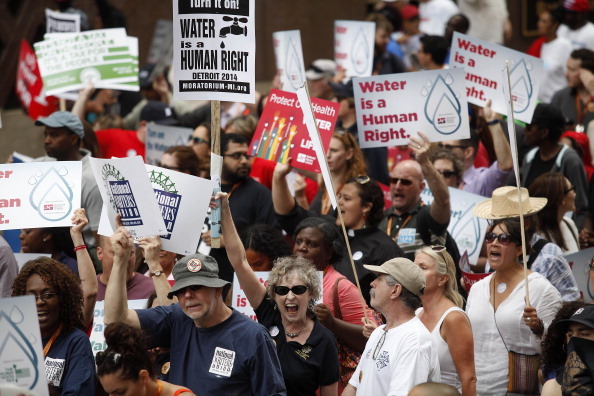 Demonstrators protest against the Detroit Water and Sewerage Department July 18, 2014 in Detroit, Michigan (Photo credit: Joshua Lott/Getty Images). After months of residents decrying water shutoffs to customers unable to pay their bills, there is tentatively good news from Detroit! Mayor Mike Duggan has promised a plan to help customers keep their water while the city develops payment plans and financial assistance for those who need it most. “We will be developing a plan that allows those who are truly needy to access financial help and allows those who want to make payment arrangements to do so with shorter wait times,” Duggan said yesterday. Detroit’s stated commitment to support residents unable to pay for water is an important step toward resolving this human rights crisis. The United Nations, Amnesty International USA and other groups had condemned the shutoffs as violating the right to water and sanitation. The rights to water and sanitation require that they be available, accessible, safe, acceptable and affordable for all without discrimination. Shutoffs cause limited access to safe drinking water, as well as water needed for personal and household hygiene. Amnesty International USA has urged Mayor Duggan, Detroit Water and Sewerage Department head Sue McCormick and other state and local officials to stop the shutoffs to those who truly cannot pay and listen to the solutions being proposed by affected communities. 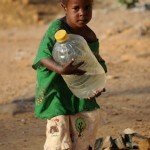 “We cannot be a society that truly values human rights if we allow impoverished families to have their water shut off, even as sports arenas, a golf course and half the city’s commercial users – all also behind on payments to the tune of $30 million – have reportedly not received notices,” Amnesty International USA Executive Director Steven W. Hawkins said earlier this month. More than 15,000 Detroit residents suffered from water shutoffs starting in March, according to news reports. The water department shut off service to accounts more than two months behind on payments or on which more than $150 was owed. As the crisis developed, more than a thousand public health advocates, local and national activists rallied in Detroit on July 18 to focus national attention to the inhumane water shutoffs. The department suspended shutoffs for 15 days as of July 21, and Mayor Duggan has indicated he may extend this pause in shut-offs. Detroit’s stated commitment to support residents unable to pay for water is an important step toward resolving this human rights crisis. Thanks to the grassroots activism and support of dedicated advocates like you, households in need will get back their access to water. At least for the time being. 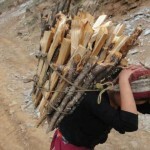 This entry was posted in Americas, Poverty and Human Rights, USA and tagged Americas, poverty and human rights, USA by The Editors. Bookmark the permalink. Interesting. Cool. My friend Rebecca in Detroit says that the water bills are not attached to a person's name. As in not linked to their credit history, etc. They are attached to property. So if someone doesn't pay their water bill for whatever reason there is not much motivation to do so until it finally gets cut off. She has a good income and a house (they're super cheap because so many are empty) and she says she has let her water bill accumulate and forgot about it because it just wasn't a priority. I don't know if they don't send bills or what. When she finally got a bill after however long she couldn't believe how high it was, was a little shocked. If someone had low income and was put in that situation it would be overwhelming. Who is going to budget for water when it comes out of the tap every day without a bill and they have other things to do with their money that are much more pressing at the time. So a change in administrating the system of recieving water may help solve the situation. the water bills in my community are not attached to an individual either. They are attached to the property and so if not paid create a lien on the property and are owed by the owner of the property.